Join us for Demo Day 2013 on Tuesday, June 11! Enjoy a barbecued steak lunch while you learn more about the quality heaters and other products available from Heater Sales and Service in Nisku. The staff at Heater Sales is excited to introduce the MAC 6000 Hydronic surface heater. This environmentally friendly unit can warm a 6,000 sq. ft. space up to 85 C (185 F). And on just one tank of diesel, it can run for up to 53 hours at full capacity! MAC representatives Mike Siefert and Travis Welle will be on hand to answer all your questions about the MAC 6000, as well as MAC’s flameless and indirect heating models. Representatives from Flagro Industries will also be available to promote their line of indirect and electric heating units. 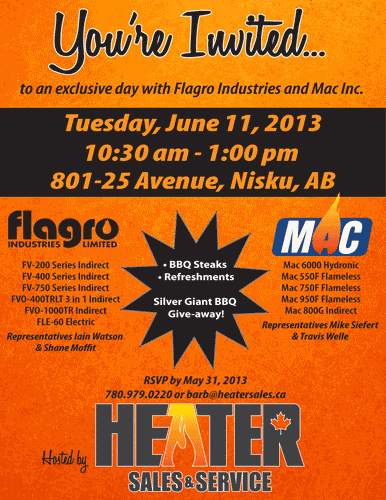 You can talk to Iain Watson and Shane Moffit about all the ways a heater from Flagro could improve your job site. If you plan to attend Demo Day 2013, please RSVP by May 31 by calling 780-979-0220 or contacting Heater Sales through the website.